With most supermarkets in the UK stretching little beyond long and short grain rice, it is astounding to think that there are almost 40,000 different varieties around the world. Explore the types of japonica rice most popular in Japanese cooking and learn more about the characteristics of these grains. Oryza sativa – what we know as the rice plant – can be divided into two major subspecies, japonica and indica. The latter, used widely in cooking across southern Asia and parts of China, is characterised by long, flat grains which fluff up when cooked. By contrast japonica rice, cultivated predominantly in Japan and Korea, has a much shorter, rounder grain and a glutinous texture which makes it perfect for picking up with chopsticks and moulding into sushi. In Japan japonica rice is further categorised as uruchimai (ordinary rice) and mochigome (glutinous rice). Uruchimai is recognisable for its short to medium translucent grains and has a number of uses including sushi and sake, while the short, round, opaque grains of mochigome are usually used in desserts or soaked and ground into a paste to make mochi, the chewy rice cakes famed for causing on average one hundred choking injuries a year in Tokyo alone. Rice is intensively cultivated in Japan despite the relatively small area of agricultural land, and imports are strictly regulated and subject to steep levies by the Japanese government to protect the domestic rice industry. The cost of domestically grown rice is also, on average, relatively high but this premium is widely accepted both as a reflection of its quality (compared to imported rice) and due to the importance of rice in Japanese culture as a whole. Although consumption has fallen by around 20% in as many years, rice still forms a staple part of the Japanese diet and the country is among the top ten rice producers in the world. The Niigata Prefecture, known by many as the rice capital of Japan, is famed for the quality of its output, particularly Uonuma which produces high quality Koshihikari rice. Japonica rice is grown all over the world, fuelled in part by the widespread popularity of Japanese cuisine. California is one of the largest growers of japonica rice outside of Japan, with Italy and Spain following close behind. Such is the importance of high quality rice in Japanese cooking that there are a number of Japanese distribution companies, the largest being the Japan Food Corporation International (JFC), who supervise the production of rice and provide training in traditional Japanese growing methods to foreign farmers. Specialist supermarkets outside of Japan will often stock a mixture of domestic Japanese rice and cheaper American or European varieties to cater to all tastes and budgets. 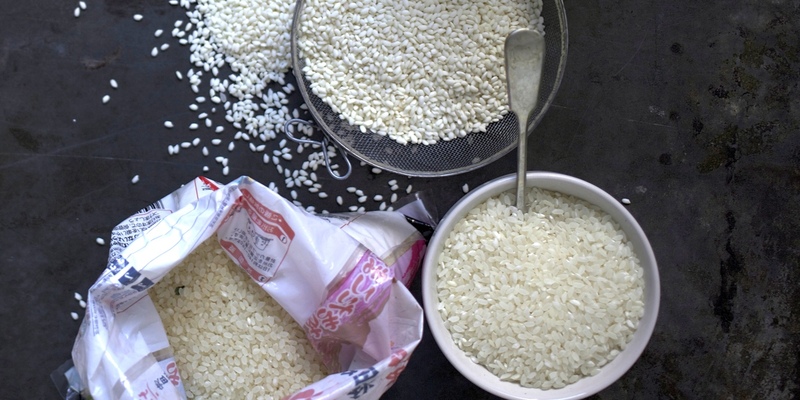 Three of the biggest selling varieties of rice in Japan are Sasanishiki, Akitakomachi and, perhaps most popular of all, Koshihikari which accounts for almost 40% of domestic rice production. The latter, short to medium grain with a sticky consistency and sweet, nutty flavour, is grown all over Japan (with its taste supposedly varying from region to region) as well as parts of Australia and America. Akitakomachi is also a popular choice for sushi and onigiri, with short, plump, sticky grains which retain their shape easily when moulded.